Being a warranty repair house, as well as an authorised service centre, NIS is fully equipped not only to repair existing models, but we can repair instruments 15+ years old! We are also the sole UK repair agent for a number of manufacturers, who have deemed NIS to be of sufficient quality and craftsmanship, and able to repair their products. Our fully trained electronic technicians have the ability and technical competence to undertake the most complicated of repairs, and specialising in utility instrumentation this can range from simple cable avoidance tools through to high voltage multiprocessor controlled test vans. The diversity of products encompassed within our abilities is outstanding and we offer a complete asset management service. We carry thousands of spare parts to ensure quick turnaround perhaps for our clients. We are not 'board changers' and the complexity and expense of the instrumentation we service requires us to investigate to component level. 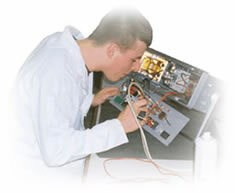 For further details, see our repair & calibration prices or alternatively contact us for a competitive quote.